Panaji : Veteran Malayalam film director Jayaraj said that, "younger film makers should be given more space in Indian Panorama." He felt that there should be focus on issues while selecting films for the Indian Panorama. 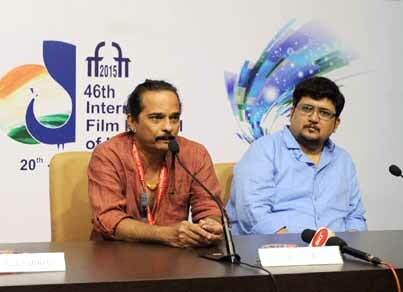 Interacting with media persons at ‘Meet the Director’programme at Media Centre on the sidelines of ongoing 46th International Film Festival of India, Jayaraj said millions of children today are trapped in child labour and that his film is dedicated to them. He said, Indian Panorama is an important forum to bring the issue of child labour to the fore. The veteran film maker said that online film release and promotion is a good platform, especially for small budget films. This medium has a huge potential as large viewership can be developed through it, he added. Ottaal (The Trap) is an adaptation of one of Anton Chekhov’s timeless works, Vanka. Although located in the 18th century, the story has travelled in time and space to be retold in the present day at a small village in South India. It is also the recipient of several awards including the Award for Best Screenplay Adaptation, The Best film on Environmental Conservation/ Preservation at the 62nd National Film Awards; and a number of Kerala Film Critics Award in 2015. Jayaraj Rajasekharan Nair is an Indian filmmaker who has directed over 35 films, in four languages. His work has been critically acclaimed and awarded in 1997; his adaptation of Shakespeare’s Othello won him the National award for Best Director.